Cap Reform - Are You Ready? With May 15th SAF deadline looming many questions remain to be answered, but some clarity is finally emerging. It is imperative that this form is submitted correctly as the area declared will set your Basic Payment Scheme (BPS) Entitlement for at least the next 5 years. We have compiled a number of key points to consider to maximise your business's future claim and to protect the value of historically held entitlements. It is worth remembering that businesses should re-register with Rural Payments before submitting a SAF Form in 2015. For an established farming business which held SFP entitlements in 2013, you will automatically be awarded one entitlement for each hectare of eligible land declared. Claimants must comply with stringent agricultural activity tests with more onerous conditions within payment Regions 2 and 3. Within these regions Claimants have the option to either maintain a minimum stocking density or conduct an annual Environmental Assessment (EA). This would have to include a plan of the holding, mammal and bird surveys and detailed habitat monitoring. As you will be aware, BPS will be topped up to account for mandatory greening measures. These will have limited impact on smaller farms and grass/upland holdings, but those with an arable rotation are likely to be affected. Briefly greening comprises crop diversification and a need for Ecological Focus Areas dependent upon the amount of arable area declared. EFA's options are fallow, field margins, buffer strips, nitrogen-fixing crops and green cover. They must be recorded and identified on a holding plan. It goes without saying that all producers must fulfil all relevant GEAC and SMR requirements. Claimants should familiarise themselves with these rules which have been amended from 2014. A number of Clients either let out or take land on a seasonal basis for grazing or cropping (such as potatoes lets) and there has been some uncertainty to who should claim on the SAF form. We strongly recommend that Clients in this situation take professional advice before submitting their 2015 SAF. Landlords should be aware that the transfer of entitlements at the end of a tenancy would be subject to a 50% syphon. The majority of farmers will be completing their applications online this year, and as there is a new IT system so the website may be slow and suffer some downtime. If you require supporting evidence such as confirmation of 2013 status or letters from Solicitors confirming your business structure then contact them now to avoid unnecessary delay. If you submitted an appeal to your allocated Payment Region then use your assumptions in the SAF Form, but state in a cover email that your SAF is completed subject to this assumption. Ensure you remove all ineligible features and make a generous allowance for EFAs. 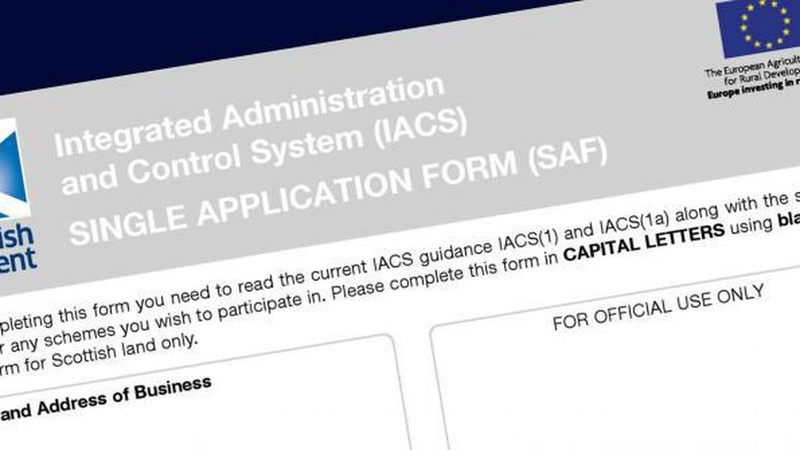 The SAF form is based on occupation on 15th May, however, BPS is paid for the calendar year and areas that are being removed from agricultural production later in the year should be excluded. 2015 sets the precedence for at least the next five years so all eligible area should be declared. Take your time completing the form, it is unfamiliar to everyone and there could be major consequences as a result of administrative errors. The next few months are going to be busy for farmers and their agent, and to say the least, are incredibly important. Whether your business is a long term winner or loser from the changes the uncertainty has impacted everyone. Further still it is likely that the sheer volume of issues to be resolved such as Payment Region Appeals may lead to the 2015 payment being delayed from the usual December payment window.